Greetings fellow renovators. It’s been a while since I’ve posted any in depth, detailed shenanigans here at the MisAdventures project. And this one will be full of photos and not a lot of dramatic before and afters – more of the tedious type – but we’re getting there. I did start a FaceBook page, just to organize the 1000’s of photos of the renovation in chronological order. If you want to follow along on my nearly daily posts you can click on it in the sidebar on the home page or you can click here. But back to the tedious – as in this photo for instance. I doubt that it’s going to be pinned to many Pinterest boards. 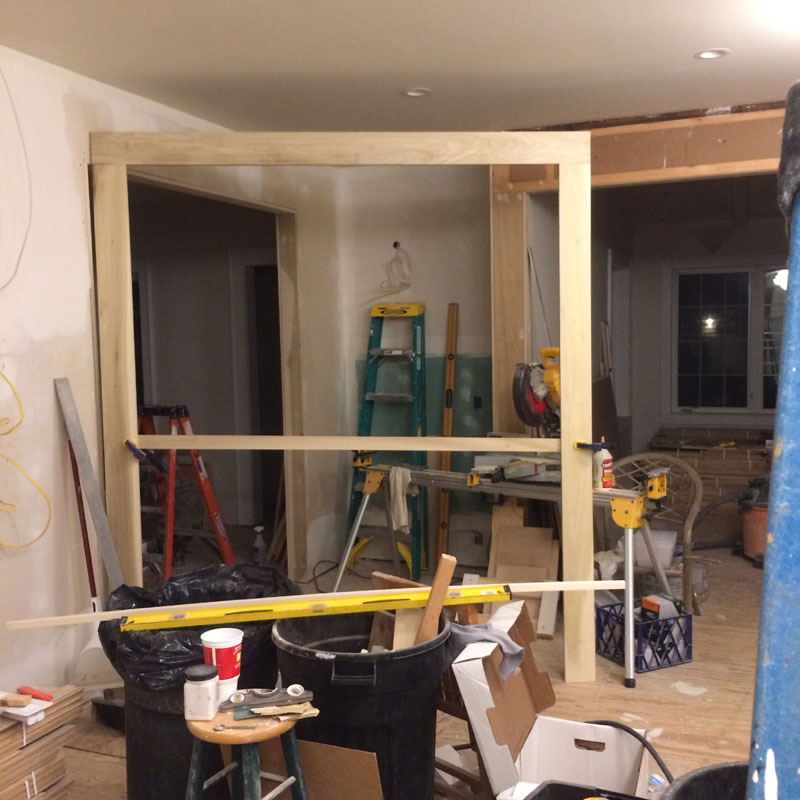 This is the casing for the big opening from the kitchen into the living room. I like to make the ‘U’ shaped piece by gluing it together and using pocket hole screws before I put it on the wall. And in this case it’s a ‘U’ that is 8′ tall and 6′ wide. I clamped a crosspiece across the bottom so I could move it by myself without breaking the glue joints. 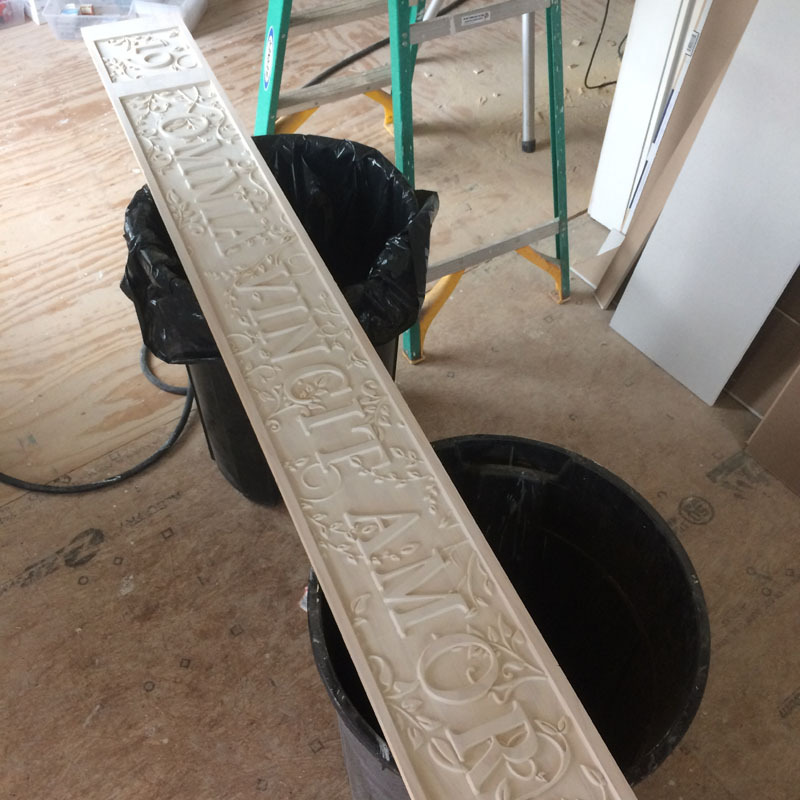 Once fastened in place, it gets another piece of back banding trim and then painted – it looks better. But maybe it’s because the photo is a little out of focus. 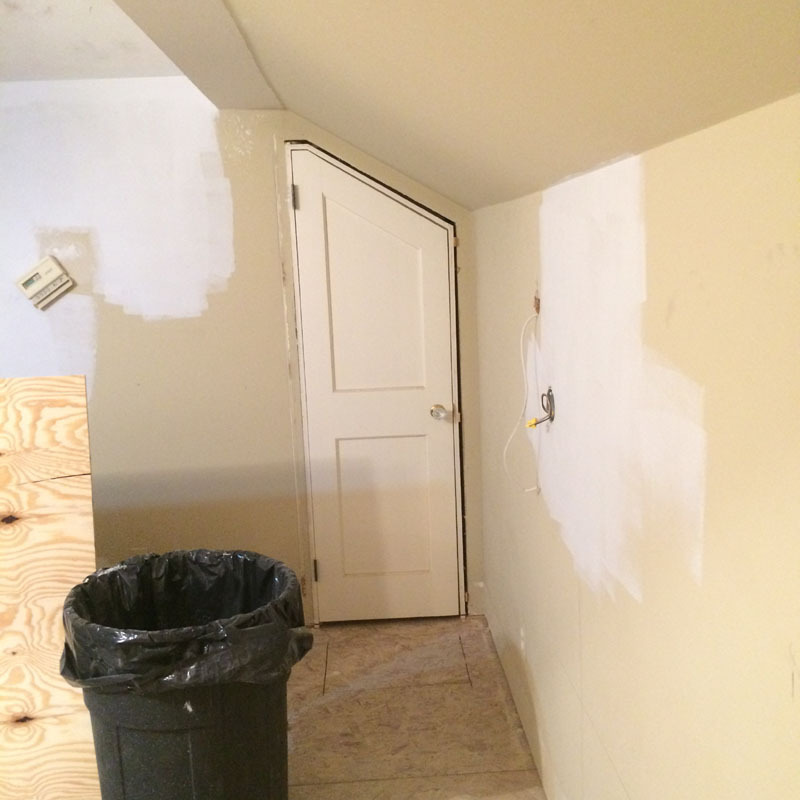 Going up to the 2nd floor master bedroom, I have this slanted door that allows access to the HVAC unit in the finished space behind. Fine, except the door is crappy, and that will never do. I’ll think of something that doesn’t look so much like a – well – like a door would be better. What, I have no idea yet. But. we’ll tear it out and figure it out later. 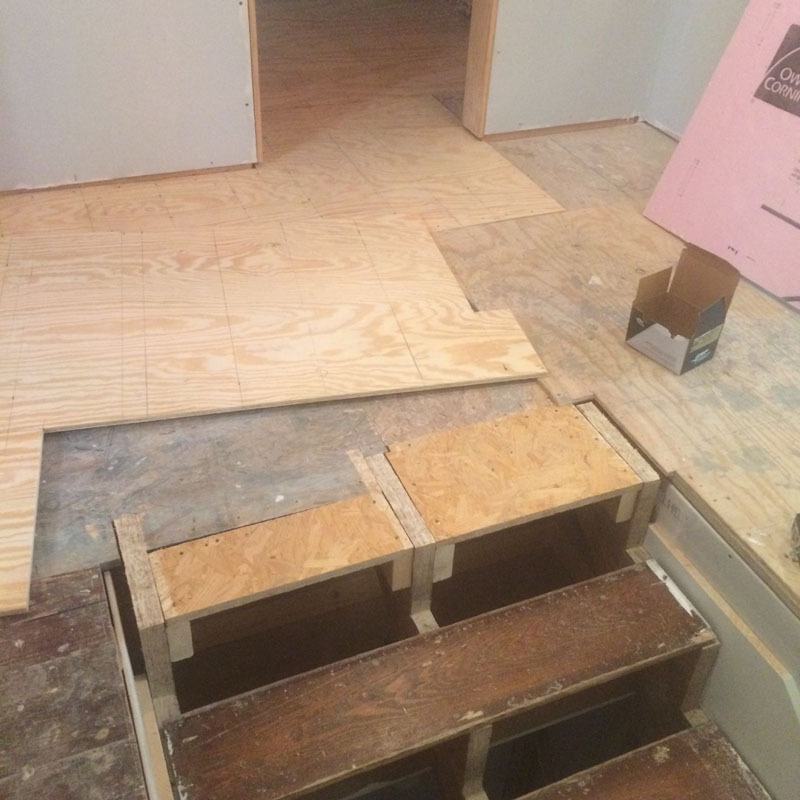 But I will patch the floor before we put another 1/2″ plywood floor on top. 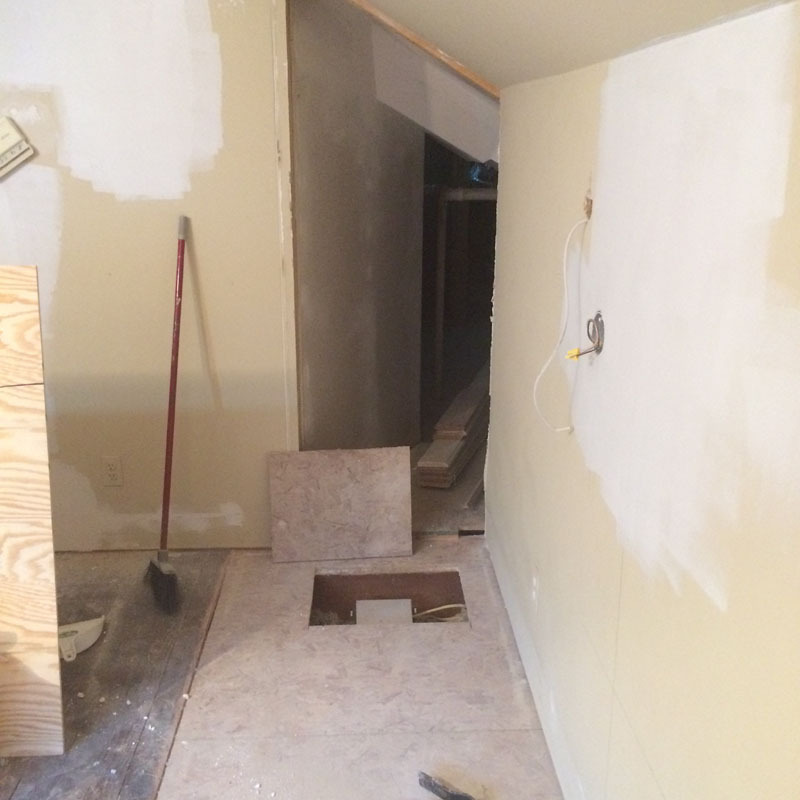 This was cut out to add a recessed light in the ceiling below. 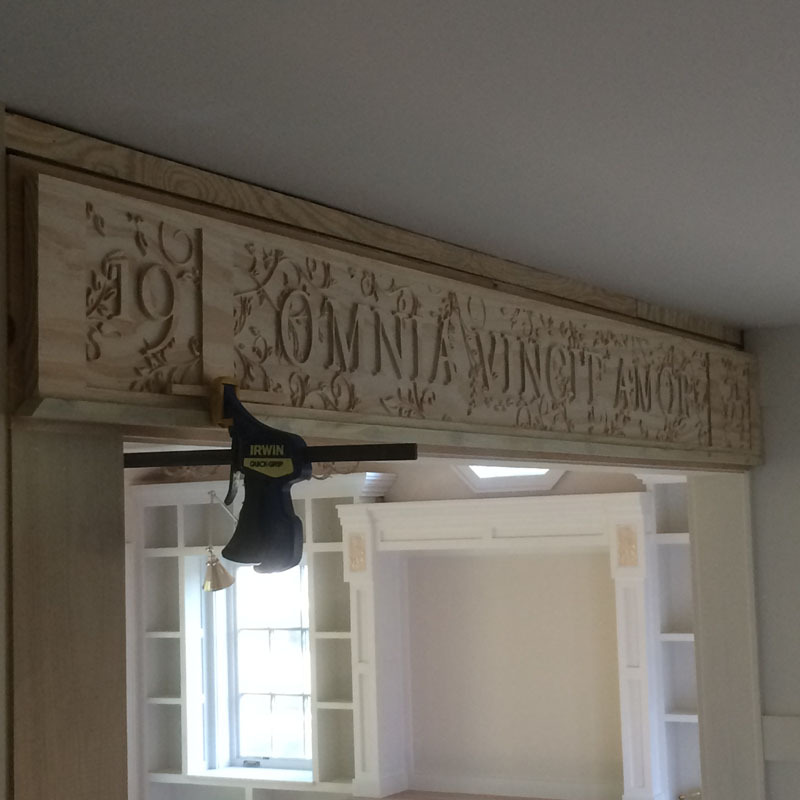 Of course, that requires moving these two antique French balcony panels for the countless time. 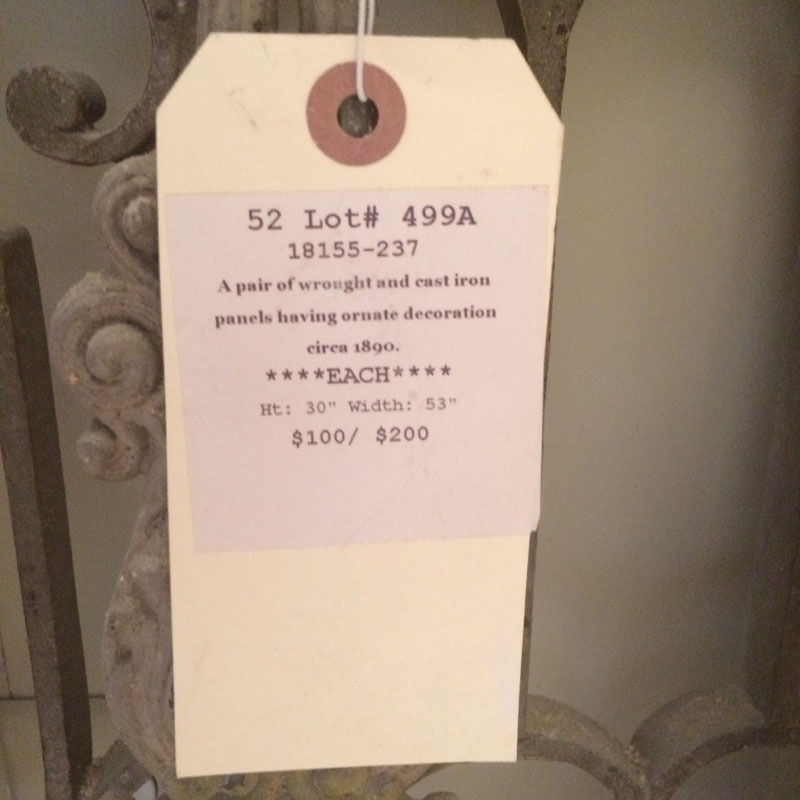 I bought them several years ago at a Philadelphia auction house after a several year search for just the right size. They are cast and wrought iron and heavy! But then I like heavy things. I bought these by telephone and had them shipped. I think I got the pair for 150.00 – and it cost 165.00 to ship. We’ll find out in a week or so if they will work as intended. 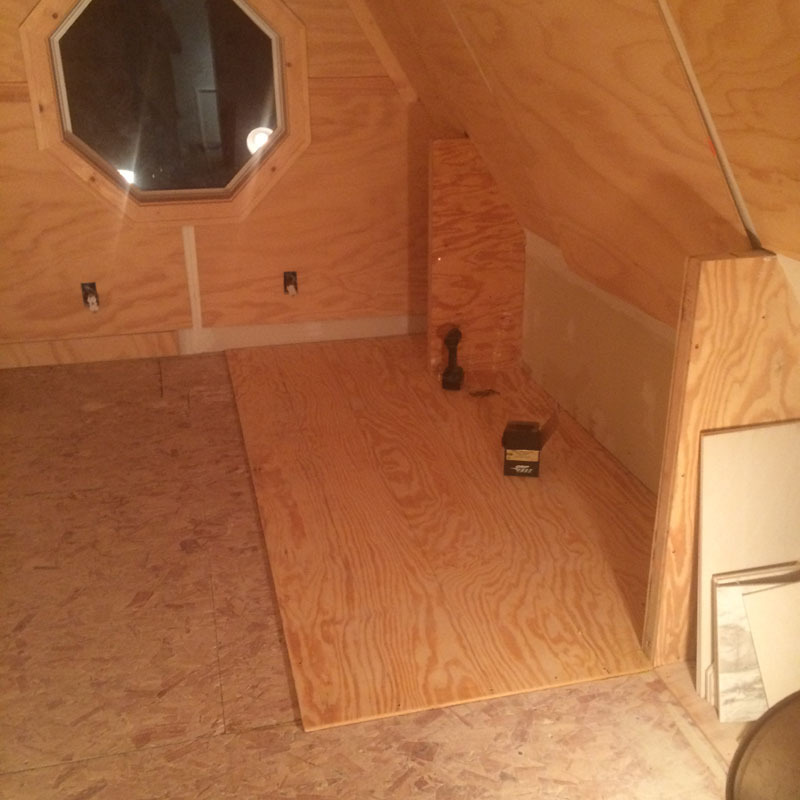 The floor is patched and It’s time to add some plywood. The areas under the eaves was an unconditioned space, but now all areas are insulated and conditioned. 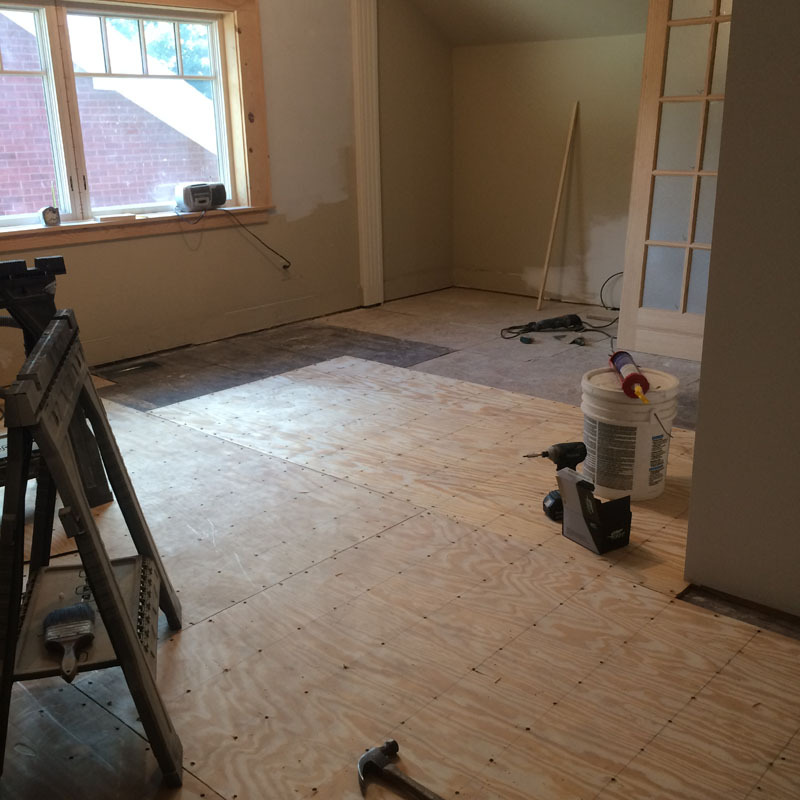 The 1/2″ layer of plywood goes over the entire floor to strengthen the areas that were cut out to add ductwork and electrical. 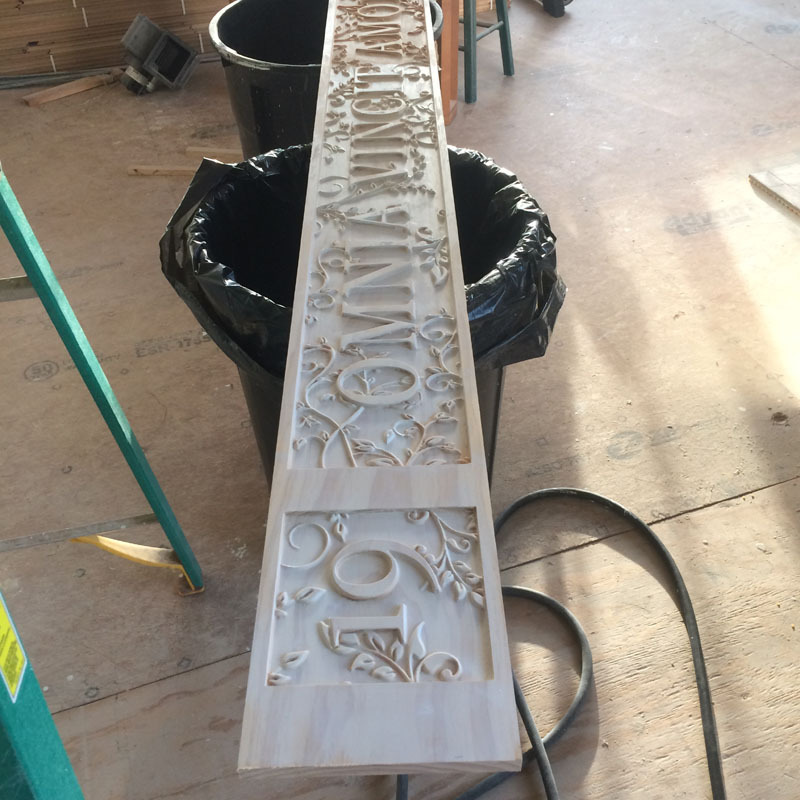 Each panel is glued in place with PL glue and screwed every 6″. 4″ on the perimeter. 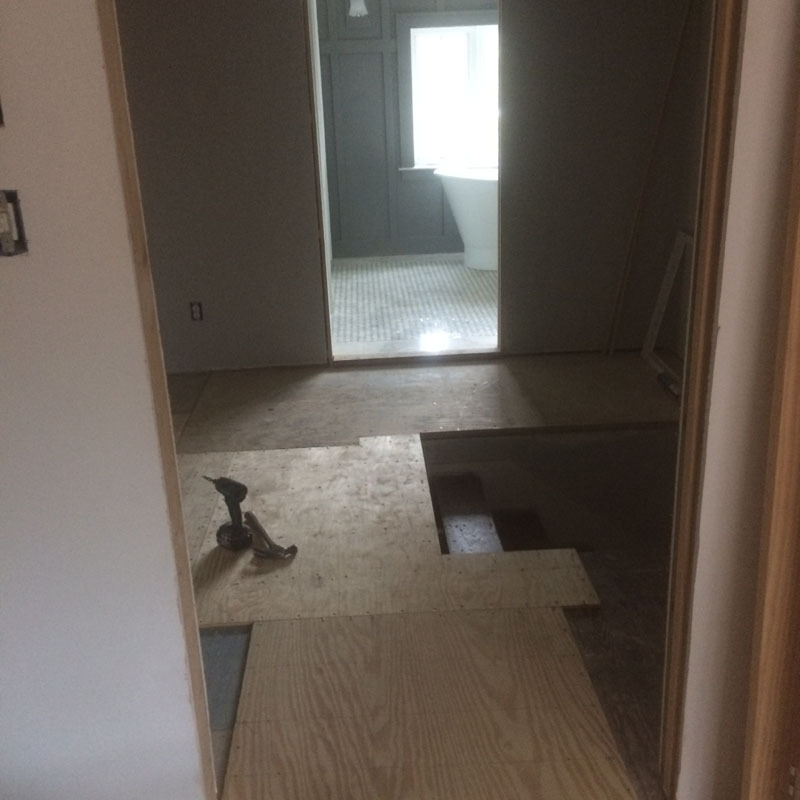 The plywood goes throughout the bedroom and the pointy closet, so it will be a seamless transition when the new flooring is installed. I just figured out that I have more wood on the outside of the walls than I do on the inside. Funny how that works. 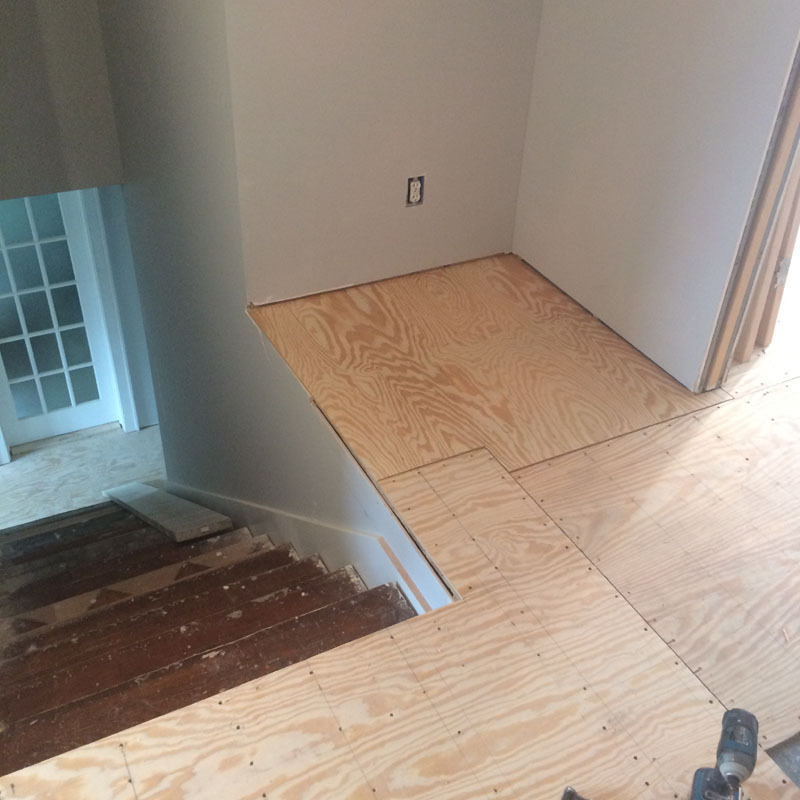 Now we get to the part of finishing off the floor/stair juncture. If you recall, I made a new staircase to create a modern, safe stair instead of the steep narrow one that was original to the house. This is the moment of truth to see if my calculations were correct in setting the height of the staircase. And we are a winner! 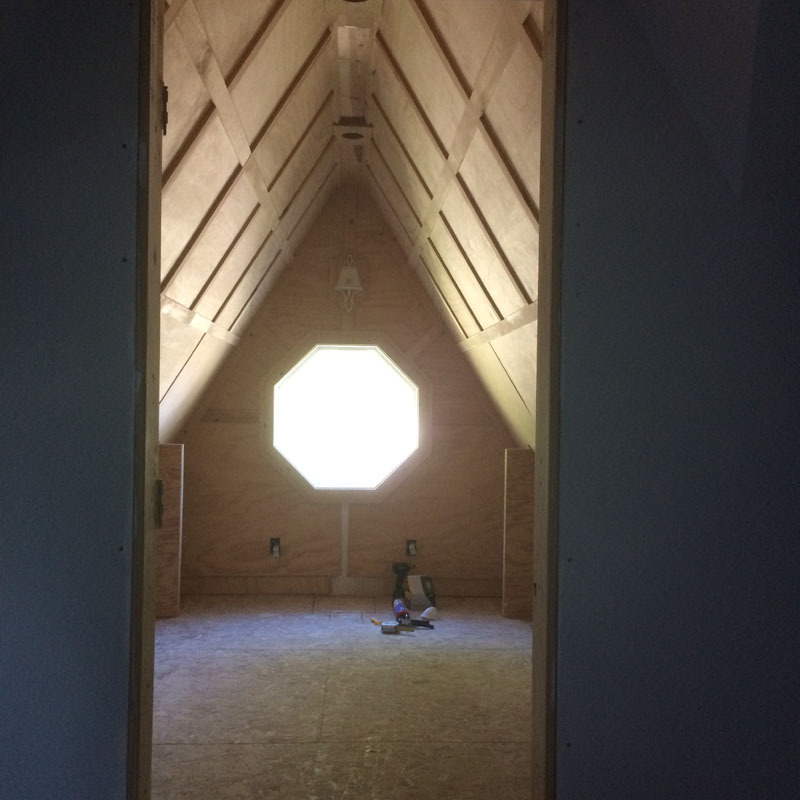 The plywood piece is cut and fastened in place. Life is good. 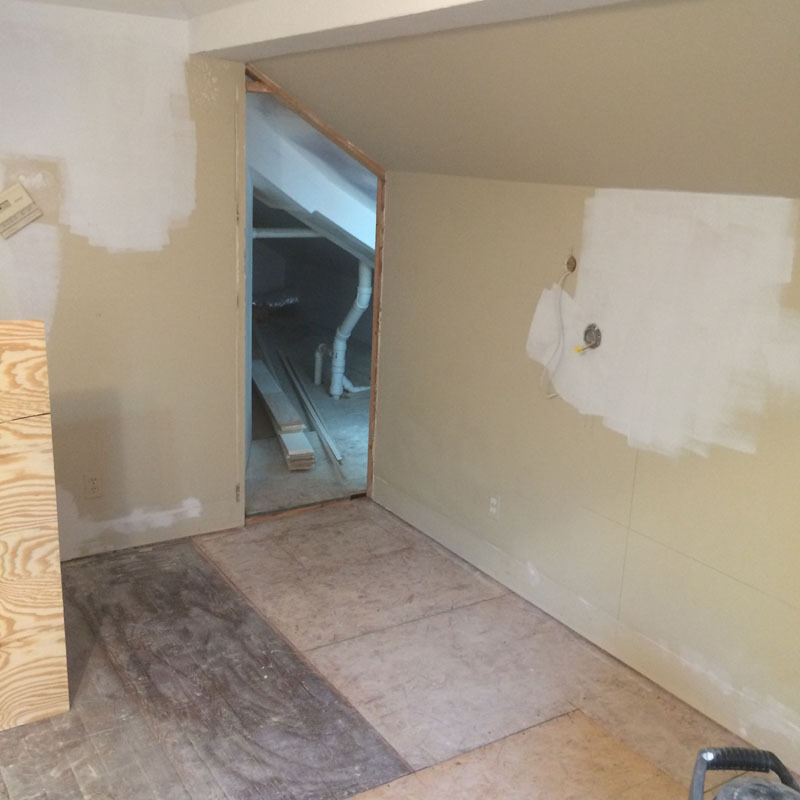 The last piece of 1/2″ plywood is down. 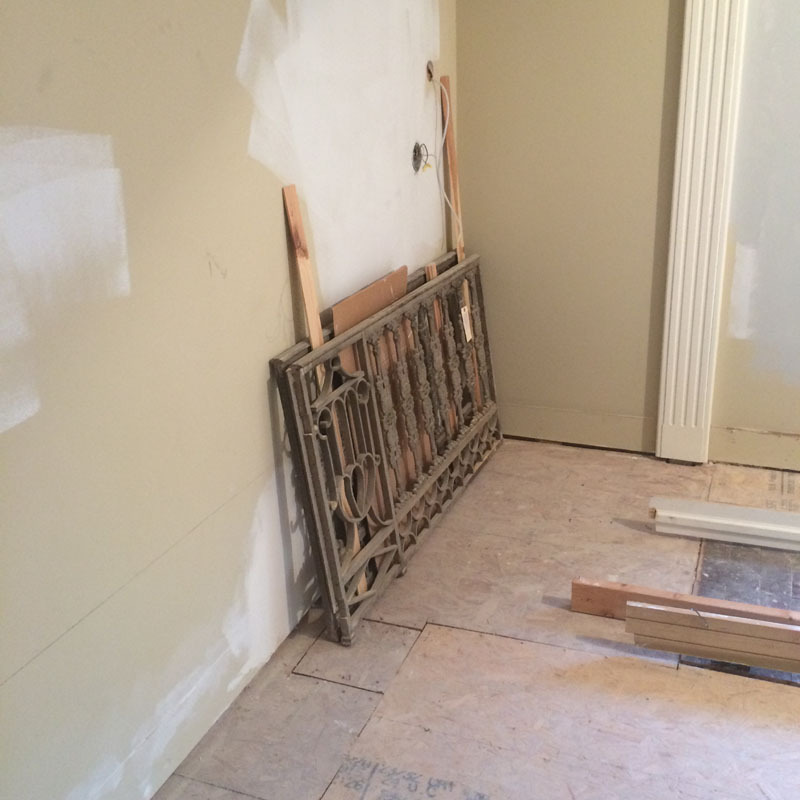 I’ll have to start figuring out what I want to do with those antique balcony panels and build the newel posts. The flooring guy will be here in a week or so to install the white oak floor. And I mean white, as in a white finish on a white oak floor. We’ll see how that turns out. At this time we also get to the art project I have posted about before. The worrisome sign that I had made in Seattle. 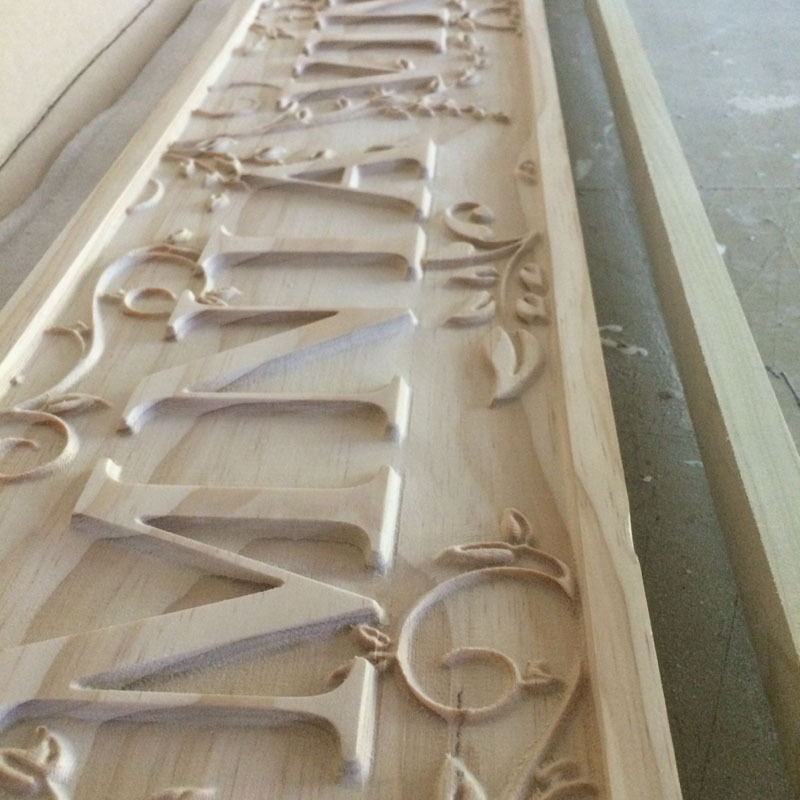 The sign-maker was a nice guy and actually made the wood carving twice. He had a problem with the computer aided carving machine. It seems it wanted to make these little grooves down the length of the sign. Which is fine if you want grooves – I did not. So I told him to send it anyway to see if I could carve and sand out the lines. I could and did, but it took about 60 hours and my fingers still hurt. 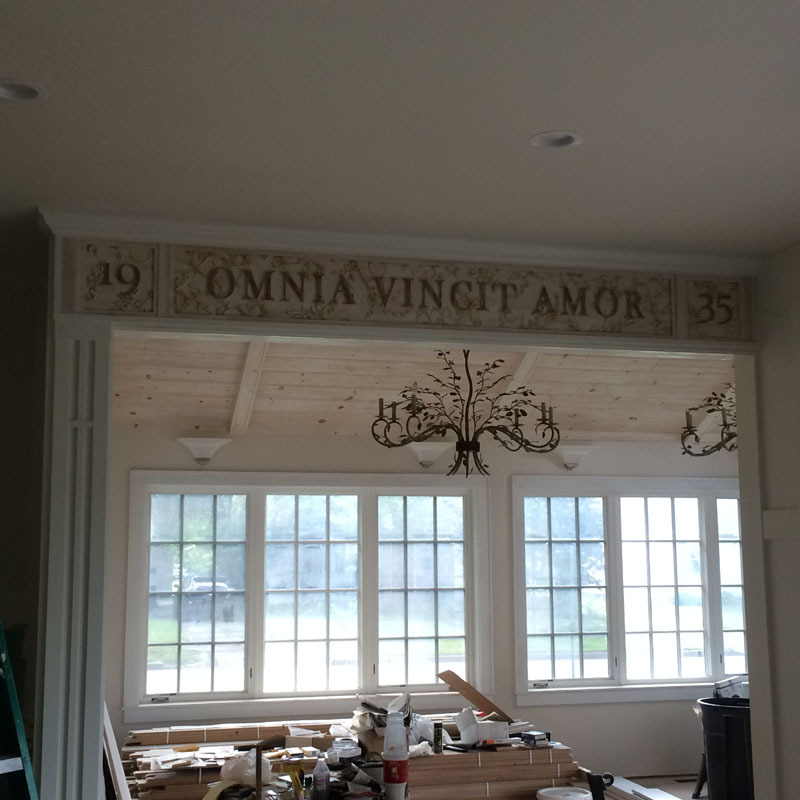 The sign goes above the opening from the kitchen into the new sunroom. Here I’m just trying to figure out how to trim this into place. 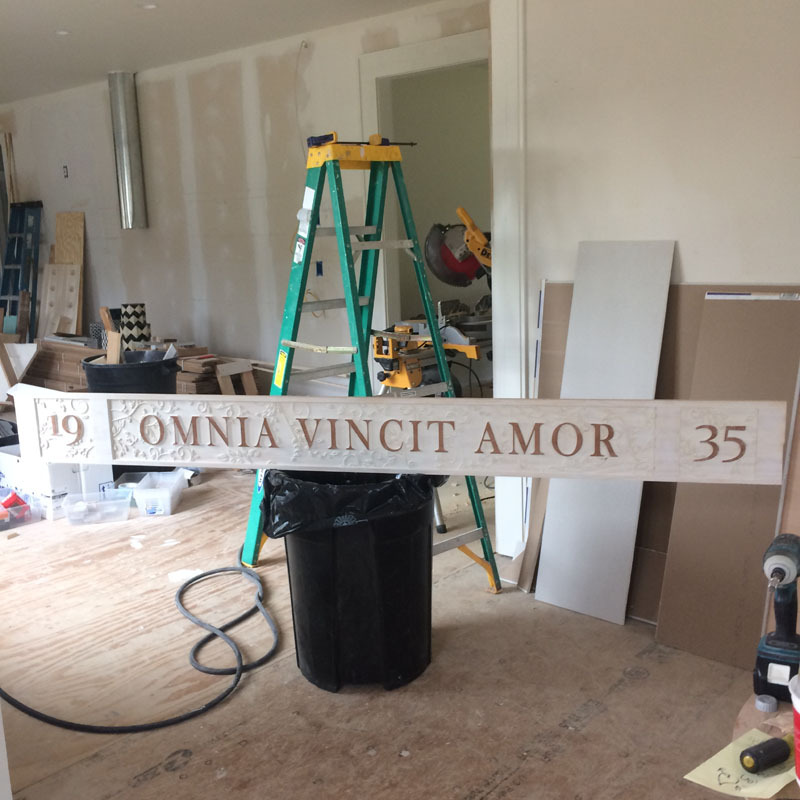 ‘Omnia Vincit Amor” ‘Love conquers all” it’s Latin from the poet Virgil. The next line in his prose is “Let us too yield to love” I kinda like that old Virgil guy. The ‘1935’ is the year the original house was built. 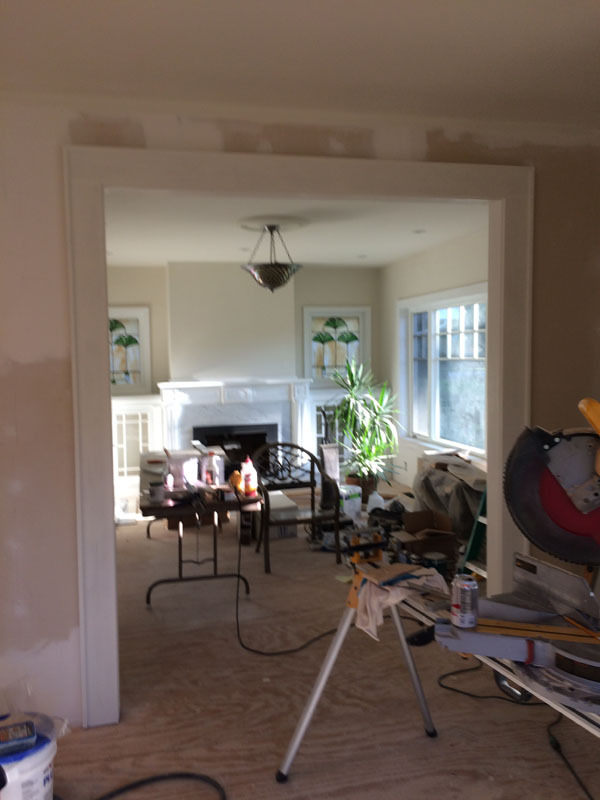 To finish, I wanted it to have the same whitewashed look as the ceiling in the sunroom.So I thinned down some white latex paint and brushed on a coat. Of course waterbased paints raise the grain of the wood, so it’s back to more sanding – like 10 hours worth. Once that’s finished a bronze metallic paint is applied to each letter and number using my finger. Using your finger allows the paint to be irregular and will help when the antiquing process begins. Another overglaze wash is added and a couple of light sandings happen.Dark restoration wax is then applied and buffed off a couple of times. 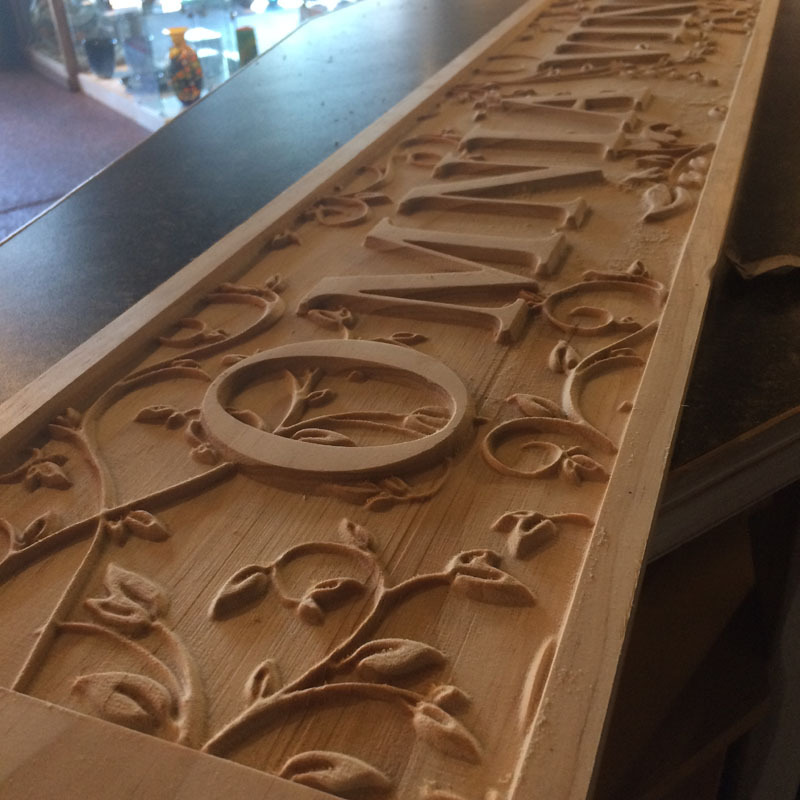 Another layer of white glaze is added to the letters and buffed off. Are you tired yet? Trim is still being mocked up to see what will work. Also note, the leaves in the sign were designed to match the chandeliers. I know, I know – I’m nuts. 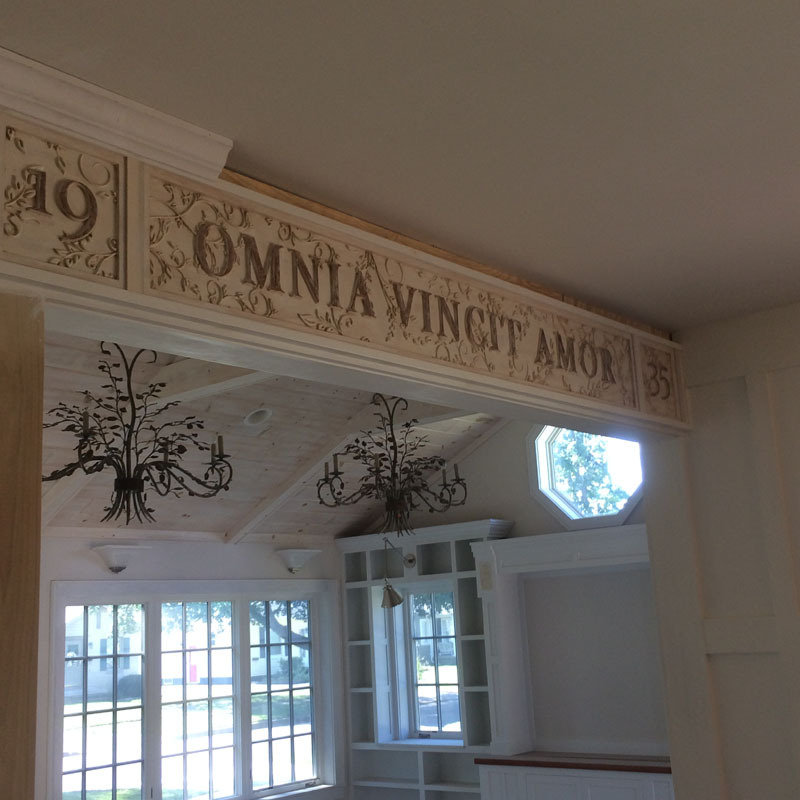 The trim details are worked out and the pilaster design was added. But after I had the trim on the column up, painted and finished, I just wasn’t feeling it. The vertical lines join the bottom of the frame of the sign and looks too abrupt to me. I always figure these things out too late. So with my trusty oscillating saw, I carefully cut the offending trim pieces out and added another horizontal piece at the top of the pilaster. Now I feel better – and I hope you do too, as you’ve come to the end of this post. Here’s hoping for a great August!